Starting to shop for your summer wardrobe? That’s a good idea. Because of the weather here in Copenhagen, we don’t really experience much of the typical spring weather: when it’s warm enough to wear only a blazer or jacket and hot enough to try going out with short sleeves. Often the weather here jumps from winter to suddenly summer (and sometimes back again), I don’t know if you believe me but I am still wearing my winter coat hahah. For the summer period I honestly don’t buy that much. When I do, it’s usually dresses. Dresses can be used for so many different occasions, they can be both casual and cute. They are versatile and so much easier to style which spares me a lot of time. That is why when Yoins.com contacted me for a collaboration and a chance to show of one of their dresses I just couldn’t refuse. 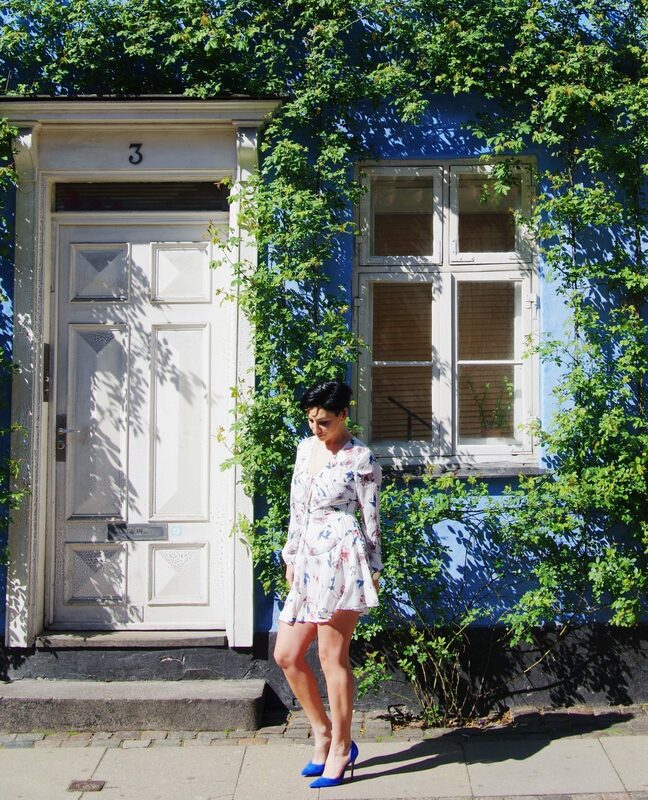 My dress has blue flowers on it and there are just so many streets here in Copenhagen with these nice cute, old houses, painted in different colors and different styles so I went out for a little walk and found a nice blue house. Speaking about blue, what better to pair the dress with than my blue heels from Zara. Together with the blazer the dress can also be used for a more formal occasion and without it works for just about any daytime activity. What do you think? Stay connected with me by subscribing to my newsletter or following me on my social media accounts: Instagram, Facebook (Like), Twitter, BlogLovin and Pinterest.